PCD Pharma Franchise in Delhi – Biofield Pharma is a proud ISO certified Company that brings you over 300+ range of drug solutions from different drug market at seemingly reasonable rates. We are looking for hardworking and dedicated staff of people who are looking for genuine PCD pharma franchise in Delhi city. You can take the PCD franchise in any product like tablets, capsules, syrups, drops, injectables, powders etc. They are all DCGI approved and made under international quality standards. The product range of our company is highly recommended by the doctors because it is effective and result oriented. The demand for quality medicines is growing and it is offering good business opportunities for people all across the globe. One of the profitable sectors to invest, the pharma industry in Delhi is quite flourishing. You can get a good business here through PCD pharma franchise in Delhi. Biofield Pharma is the best Pharma Company to offer you this chance. We bring you medicines that are completely made in Hi-fi manufacturing units where GMP & WHO guidelines are being strictly followed. If you look for business opportunities in any of the given location like Connaught Place, Shahdara, Narela, Kanjhawala, Daryaganj etc then we are the best. You can get detailed information related to Biofield Pharma business ventures near you by connecting us via email at info@biofieldpharma.com or simply call us at +91-9216300566 or +91-9216300166. Our company representatives will let you everything from procedure to benefits of being our PCD franchise member. You will get a wide variety of DCGI approved product list. We have ensured full quality control measurements being followed in our units. The contamination-free environment is taken good care. We have logistic partners in different areas across Delhi. They help us keep a track record of your orders and form a good network. More than 300+ drugs are offered by the company to its PCD franchise members. We keep on adding new medicines and products to our list for our customer benefit. Biofield Pharma welcomes people across Delhi that look for genuine business deals. As we look for serious members, our company needs spirited and hard working individuals and groups who are interested in the pharma business. It is our duty to offer you better business scope in the market. We have been trying to bring you better business dealerships covering places like Defence Colony, Dwarka, Rajouri Garden, Shahdara, Saket, Seelampur, Preet Vihar, Narela, Kanjhawala, Daryaganj etc. You can take PCD franchise in any of the given locations above. It is our promise to bring you good business opportunities in this sector. 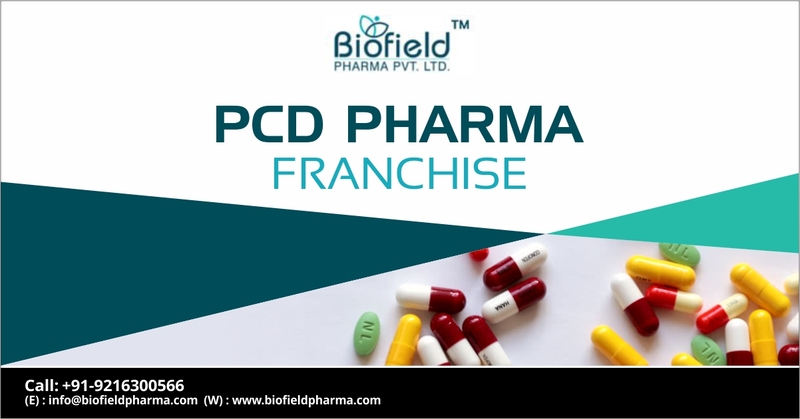 Biofield Pharma brings you over 300+ drug formulations for PCD franchise. They cover numerous drug markets where you can start or expand your pharma business. We always maintained high quality when making drug solutions. The entire list of medicines is approved by DCGI and marked with the highest accreditation. We have our own self-owned units that are situated in excise free locations offering high output and better facilities. You can take PCD franchise in any of the general or specialized segments of ortho medicines, gynecology, dental medicines, dermatology medicines, nutraceuticals medicine etc. These cover antibiotics, analgesics, anti-allergic, anesthesia, anti-infective etc medicines that meet your frequent demands as a franchise vendor in Delhi. Our company has been a popular name providing pharma distribution opportunities across the state as a top Delhi based pharma company, You can invest in our company for better deals. The better scope of growth is a promise here.